Pumpkin cinnamon rolls are a new fall staple! 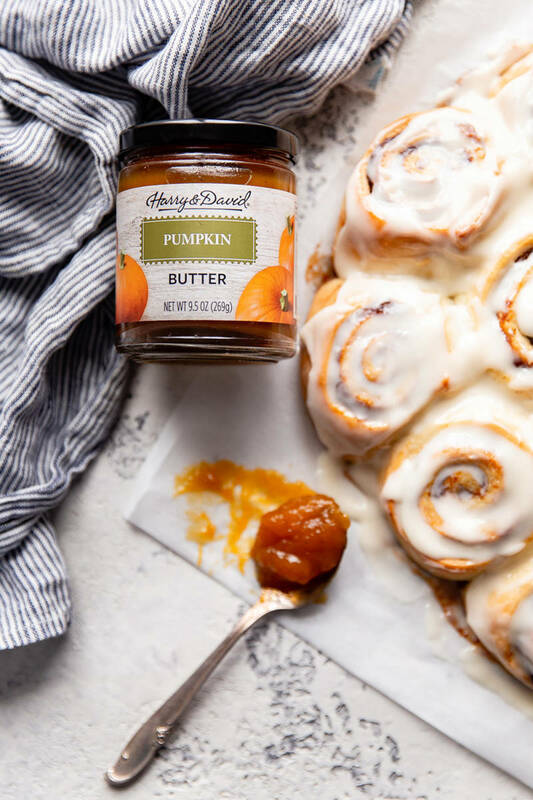 These ooey-gooey pumpkin butter cinnamon rolls created by Laura from A Beautiful Plate are soon to become your favorite start to weekend or holiday mornings thanks to a sweet swirl of Harry & David Pumpkin Butter. 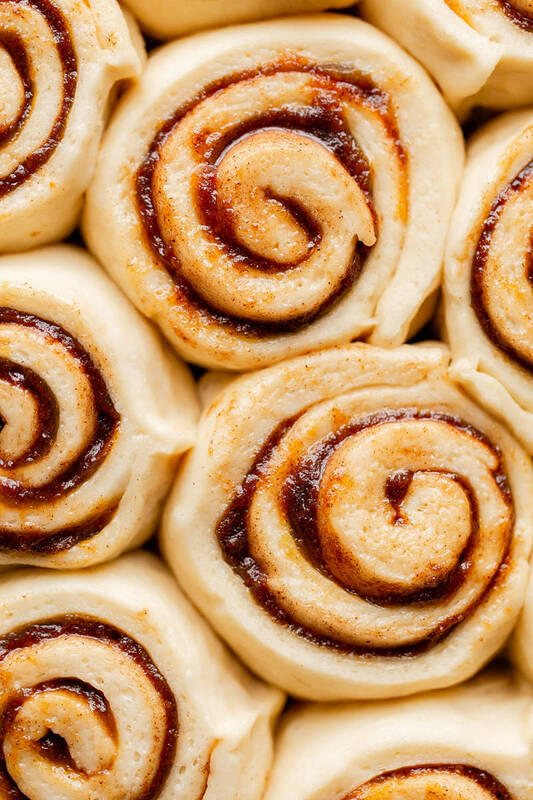 Nothing beats a batch of homemade cinnamon rolls warm from the oven, especially during the holiday season. 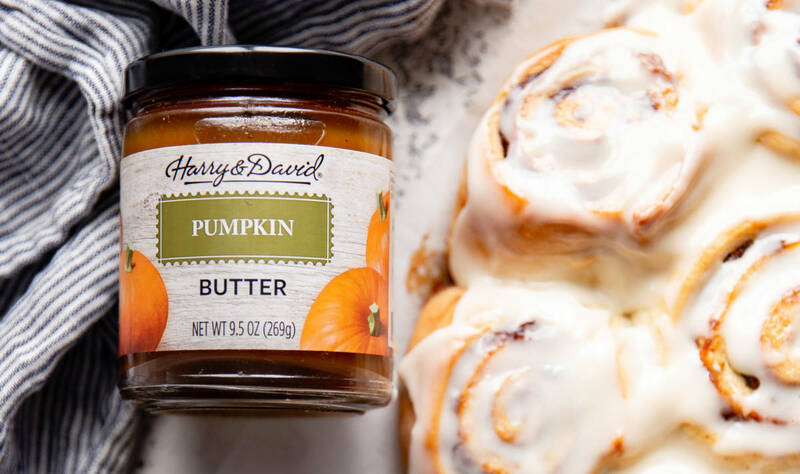 This classic baked good has been given a fall-inspired twist with the addition of Harry & David Pumpkin Butter. The basic method for making these rolls is nearly identical to standard cinnamon rolls with the exception of the filling. In lieu of melted butter, this recipe turns to pumpkin butter. If you’ve never worked with pumpkin butter, it’s essentially a slow-cooked, thick jam made from pure pumpkin, baking spices, and sugar. And, while we love making our own cinnamon roll dough, you can make this process even simpler by trying it with ready-made pastry dough! The pumpkin butter, layered with a dusting of cinnamon and brown sugar, caramelizes during baking and infuses these rolls with the perfect amount of fall spice and pumpkin goodness. 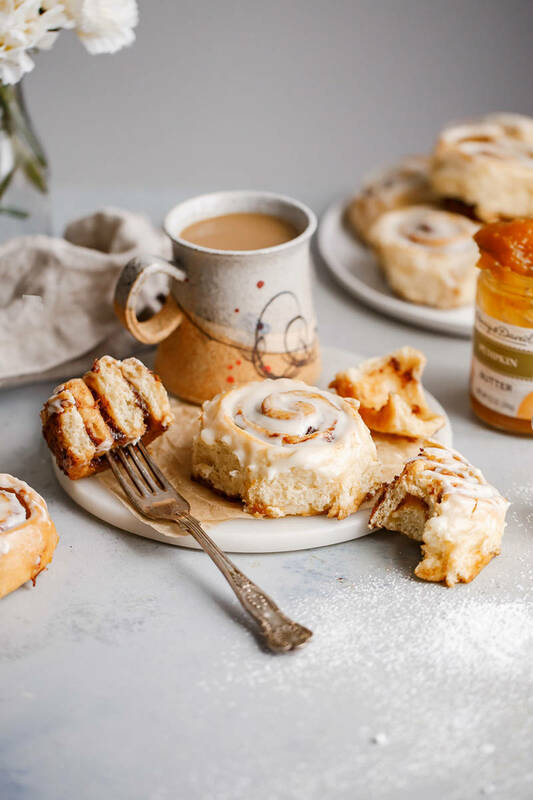 These pumpkin butter cinnamon rolls are fluffy and tender – as any good pumpkin cinnamon roll should be – and addictively good! They are then slathered with a decadent maple cream cheese frosting, which provides a touch of tang in every bite, and takes these rolls over the top. 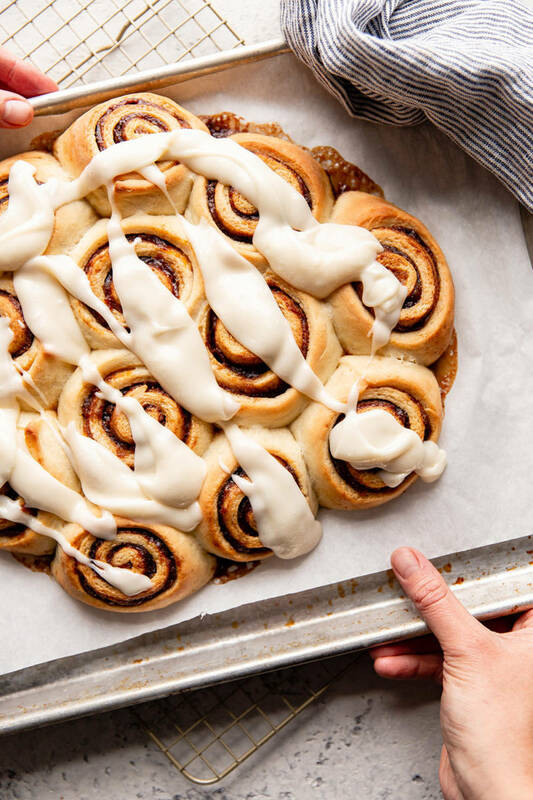 You can even prepare these cinnamon rolls the day before serving (see recipe notes for details), which makes them ideal for holiday brunch entertaining. You’ll never look at pumpkin butter the same way again! Hungry for more? Try some of our other favorite pumpkin butter recipes, like this Cranberry Pumpkin Butter Bread. Place milk in a microwave-safe measuring cup. Microwave in 5 to 10 second intervals until the milk reaches between 100-105 degrees Fahrenheit. Sprinkle the yeast on the surface of the milk and allow the mixture to sit, undisturbed, for 5 minutes. In a large mixing bowl, whisk together the all-purpose flour, sugar, and salt. Add the milk-yeast mixture, beaten egg, and cubed butter. Using a wooden spoon, mix until the dough just starts to come together. It will be fairly shaggy. Transfer the dough (and any dry bits) to a floured countertop. Press the dough together, dusting it with more flour as necessary, until it comes together completely and the ingredients are evenly incorporated. Knead the dough, dusting it with flour if it is sticking to your hands or countertop, for 5 minutes, or until it is very smooth and supple. Transfer the dough into a clean bowl, cover tightly with plastic wrap, and allow to rest in a warm place for a minimum of 1 hour, or until it has at least doubled in size and is soft and aerated. Line a half sheet pan with parchment paper and set aside. In a small bowl, combine the brown sugar, cinnamon, and salt. Set aside. Once the dough has doubled in size, transfer it to a lightly floured countertop. 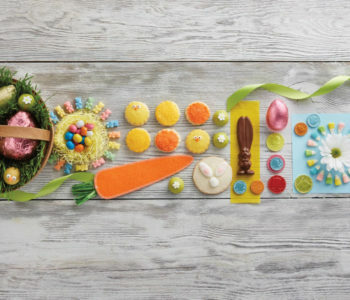 Using a lightly floured rolling pin, roll the dough into a large rectangle that measures 18-inches (46 cm) long and 12-inches (30.5 cm) wide. Dollop the pumpkin butter evenly across the surface of the dough and using an offset spatula, spread into an even thin layer leaving a 1/2-inch border on all sides. Sprinkle the cinnamon sugar mixture evenly over the pumpkin butter. Starting on the long side of the rectangle, carefully roll the dough into a tight spiral. 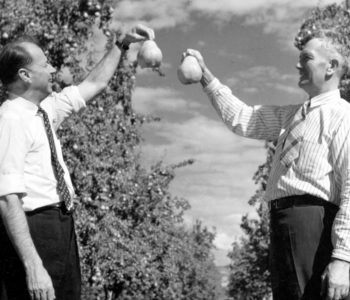 Gently pinch the dough to seal. Trim both rough ends of the roll and discard (*you can bake these, but they're usually smaller in size and don't contain as much filling). Cut the dough into 12 slices (the easiest way to do this is to cut the roll in half and then cut each half in half, and each quarter into three even slices). Transfer the slices, filling side up, onto the center of the prepared sheet pan in relatively even rows. 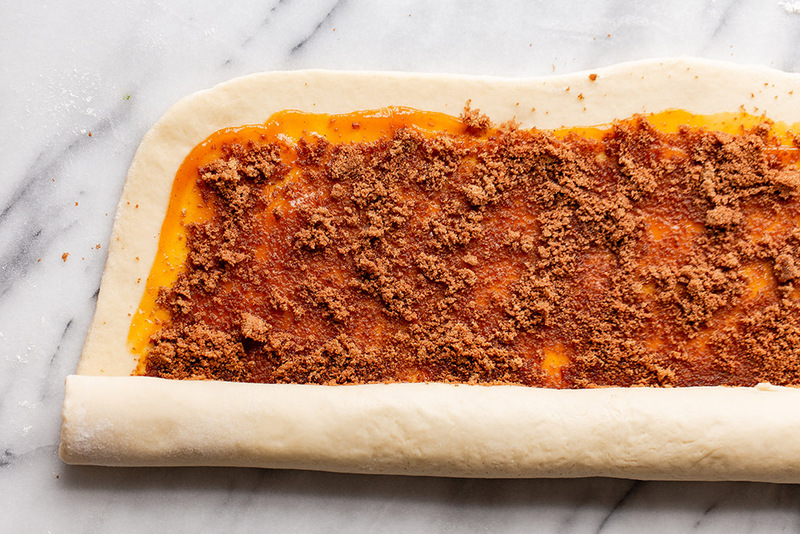 The slices should be touching (without compressing one another) and the seams of the rolls should be facing inward to prevent them from unrolling in the oven. Cover loosely with plastic wrap and let rise in warm place for one hour or until they have risen and expanded quite a bit. (To Make Ahead: Allow the rolls to rest at room temperature for 30 minutes, then transfer to the refrigerator overnight. 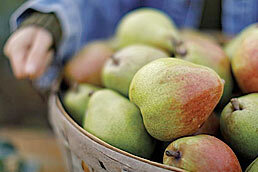 Remove from fridge and allow to come to room temperature for about an hour prior to baking. As the rolls are resting, preheat the oven to 350 degrees Fahrenheit (180 degrees Celsius) with a rack in the center position. Remove the plastic wrap and bake the rolls for 28 to 35 minutes, or until they are golden brown. While the pumpkin butter cinnamon rolls are baking, prepare the maple cream cheese frosting. Using a hand-held mixer or small food processor, beat the cream cheese, maple syrup, and salt until creamy. Add the powdered sugar and beat until completely smooth. Set aside. Drizzle and spread the frosting evenly over the warm rolls. 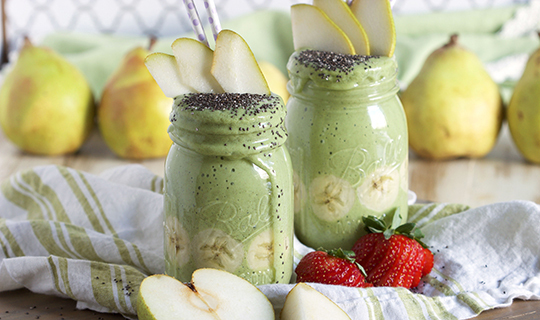 Allow to cool for about 5-10 minutes before serving. These rolls are best served warm out of the oven or the day of baking, but leftovers can be stored in a closed container for up to 2 days at room temperature.